STATIONERY and STATIONARY are commonly confused – and often by people who really should know better. I’ve seen graphic designers and printers offering ‘eye-catching STATIONARY’ more times than I care to remember – most recently in a glossy brochure promoting the services of a Gloucester-based design agency. It makes me cringe – and I’m not the only one. So, here’s a simple tip to help you remember the correct spelling every time. STATIONERY is a noun that means the tools used in offices, or for writing – paper and pens, in a nutshell. You can remember E for Envelopes, or ER in papER. STATIONARY is an adjective used to describe something that’s still, or not moving. Remember the AR in pARked cAR. “Sorry I’m late – I was stuck in STATIONERY traffic” makes no sense. Unless it was a queue of Office World vans. 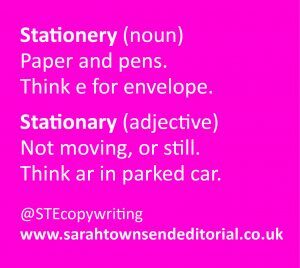 I hope this simple tip helps you remember the difference between STATIONERY and STATIONARY.